Is environmental racism good for white folks? The answer isn’t as obvious as it might seem. In the United States, there is plenty of evidence that African Americans, Latinos, Asian Americans and Native Americans typically face greater pollution burdens than whites, with associated health risks. So if the same total amount of pollution were spread more evenly, whites would wind up breathing dirtier air. But would total pollution remain the same? Or would pollution decline if it was no longer disproportionately inflicted on minorities? A recent study by a team of researchers at the University of Massachusetts, Amherst, finds that toxic air pollution from industrial facilities is a variable, not a constant, and that the total pollution load is correlated with the extent to which minorities bear higher-than-average pollution impacts. We measure the extent of disparities in U.S. metropolitan areas by comparing the share of minorities in total exposure risks from industrial air toxics, calculated from U.S. Environmental Protection Agency data, to their share of metropolitan population. In Birmingham, Alabama, for example, minorities bear 62 percent of the air toxics exposure risk, but constitute only 31 percent of the population. In metropolitan areas that rank in the top five percent nationwide for minority discrepancy, the average toxic exposure for all residents is more than double that in metropolitan areas that rank in the lower 75 percent. Among minorities, average exposure is almost four times higher. 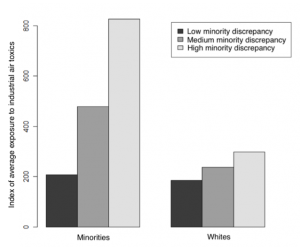 But for whites, too, average exposure is higher in the high-discrepancy cities by a factor of roughly 60%. There are two ways this striking correlation may be explained. One possibility is that wider discrepancies lead to more pollution. The perception that environmental costs can be shifted onto minorities may translate into weaker environmental regulation at existing facilities and greater willingness to accept new polluting facilities. If so, however, the fact that whites end up breathing dirtier air, too, implies that they do not fully escape the consequences. A second possibility is that more pollution leads to wider discrepancies. Some cities may have high levels of industrial pollution for historical reasons, such as proximity to markets or inputs, and in these areas whites may have invested more political capital in zoning and housing policies that shift pollution burdens onto minorities. Both explanations could contribute to the outcome. In either case, the fact that minorities face heavier pollution burdens attests to the continuing relevance of race and ethnicity in the distribution of political power in the U.S.
Income matters for pollution exposure, too. Among both whites and minorities, households with incomes below the poverty line have higher-than-average exposure. But race and ethnicity have stronger effects than income. As a result, the average exposure faced by non-poor minorities is 20 percent higher than it is for poor whites. This means that environmental disparities cannot be attributed simply to market forces, whereby pollution depresses property values and this induces poor people to move into the neighborhood. Other forces must be at work. Environmental justice advocates firmly reject the charge that they are merely engaged in NIMBYism – the “Not in My Back Yard” politics that seeks to displace hazards onto other communities. Instead they have voiced the more inclusive demand, “Not in Anyone’s Back Yard.” The UMass study suggests that this is more than a slogan, and that advances in environmental justice could lead to cleaner air for all Americans, regardless of race, ethnicity or class. Having cleaner anything is a gift that only people who can afford it have it. Clean air is something of the past as the environment is not taken care of anymore with such heavy emphasis placed on just building rather than planting. It’s so important to take advantage of the renewable energy resources in the area. Not only is it smart and ethical, but it is cost effective for buildings to utilize green components. Companies like Qualified Cleaning Services adapt to ethical changes like this by providing green cleaning without harming the environment.